Usborne Listen and Learn First German Words is a fun, interactive tool that will allow children to learn and listen to over 100 everyday German words spoken by a native speaker. Children will enjoy choosing one of the four double-sided illustrated topic cards and slotting it into the book’s special frame Each topic features sixteen words with colourful corresponding pictures; children press an illustration to hear the word read aloud. The pictures are labelled in English and German. 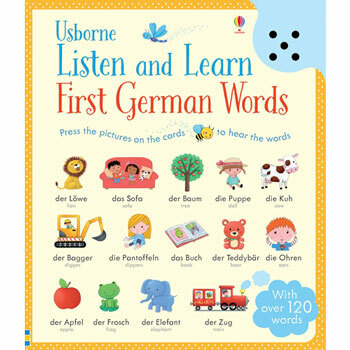 Usborne Listen and Learn First German Words is fun for young children to learn German as either a first or second language. It is aimed at ages 2 - 5 years. This book is published in the UK.